15 Gram bottles of QuickBurst H-3 Compound sell for $35.00 each. Shipping is ORM-D USPS Surface only. 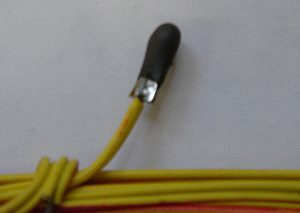 H-3 Compound is used to dip e-match chips. The product is shipped as an easy to produce kit. It comes with the mixing jar, wooden stir, clear instructions and everything you need to produce a reliable e-match dip, except acetone, acetone is available at most hardware stores. Fifteen grams of H-3 will produce a great deal of matches, possibly hundreds. Dip your e-match chip so that about half of the chip is covered and hang to dry. Your e-matches will be ready to use the next day. Mix the product exactly as described, thin with acetone as needed. Do not substitute anything for the acetone, use acetone and acetone only. Do not coat the finished matches with anything. It is not needed and could possibly affect function. Ematch chips are not available through QuickBurst. Your e-matches will work best if they are totally surrounded by the ejection charge. A small cylindrical tube is best. Be sure to fill the void between the top of your ejection charge and the top of your container with non flammable packing. This will prevent the ejection charge compound from shifting during the stress of flight.